The path to becoming a Champion is fraught with challenges. Rivals to confront, trials to overcome, and sometimes a particularly rotten group of thugs to overthrow and prevent from creating a new world order. It can be tough, and then you’ve gotta beat four other guys on top of all of that? Pretty intense. And yet they’ll still do it. Diantha is a Supporter card that has an extremely potent effect. Playing her enables you to retrieve any two cards from your discard pile – but there is a catch. You have to have had one of your Fairy-Type Pokemon end up getting KO’d during your opponent’s last turn. I’m not always a fan on cards that need you to be behind to gain advantage of some kind – probably been spoiled by Yugioh’s enabling searches and stuff for hardly any cost, let alone being behind – but Diantha provides Fairy decks with something that not a whole lot of decks have: recovery. Sure, you can get back Energy in some manner, but what about the good Supporters? What about a crucial set of Items? What about maybe a Pokemon that had been previously KO’d – OH HEY YOU’VE GOT A CANDIDATE FOR THAT! Currently, the big Fairy deck I can think of is Gardevoir-GX, which could benefit from this in some manner. Perhaps you recover a Rare Candy/Gardevoir-GX to go right into when it’s your turn. Or maybe you need to retrieve a Guzma and that extra Fairy Energy to power it up? Whatever the case may be, retrieving 2 cards for the price of 1 isn’t too shabby, but it is something that you’ll need to have planned around accordingly. Picking the right two cards you’ve used previously can be the difference between either helping to turn things around or be your downfall. No pressure though, especially for a future Champion. Arora Notealus: Honestly, I find Diantha to be the most forgettable of the Champions. Probably doesn’t help that, unlike a lot of the others, she doesn’t really have that much presence for the players outside of maybe one interaction? All the other Champions at least have something to work with – whether it be your rival from RBY, Lance’s investigations and previous Elite Four status in GSC, Steven working around in Hoenn during RS and then replaced by Wallace in Emerald, Cynthia…just…being Cynthia. Even Alder’s got more presence, and that guy wasn’t even a Champion you had to fight in the course of the main game! Side Review: Drifblim – one good way for your opponent to sneak that KO onto you might be through Drifblim, but Gardevoir-GX isn’t exactly focused on spreading counters around. Honestly, if there was a way to spread counters on your own guys outside of splashing another Type in or using an attack, stuff like Drifblim would be pretty busted. I mean, in theory he could Damage Transport upwards of 240 damage, if you’ve got a full Bench of Pokemon with everyone having 40 damage or more on them. Outside of such a rare scenario, though, Drifblim might see tech against cards like Tapu Koko but won’t be seen much otherwise. Next Time: To what lengths would you go to to get that much needed boost? Diantha requires good timing to make the most out of this card. One of your Fairy Pokemon has to be knocked out during your opponent’s last turn. If it does, then you put two cards from your discard pile onto your hand. It can be any card, like the Pokémon that was KOed, or basic energies, or even trainers. Grabbing a Supporter, however, badly telegraphs your opponent of what you’re about to do next turn. The competition would be Puzzle of Time, since it also recovers two cards from the discard into your hand, but requires you to play two Puzzles at the same time. When Puzzle is about to leave Standard, I can see Diantha being a good replacement for Fairy decks. Others will have to look elsewhere. Diantha (FLI 105) debuts in the Forbidden Light expansion set. This Supporter card allows you to retrieve two cards from your discard pile – if a Fairy Pokemon was KO’d during the last turn. And it doesn’t have to be an active Pokemon. I had a Glaceon GX snipe a Flabebe off the bench, and that activated Diantha for me. Diantha’s a good card, it’s like Teammates (and I used to use Teammates A LOT!) but for your discard pile instead of your deck. But there are still all kinds of fun cards to pull out of your discard pile. Like I always say, if you played a card once, chances are you wouldn’t mind playing it again. Plus, it’s a good way to know you can discard an Item or Pokemon early because you’ll more than likely be able to pull it back out again at some point later in the game. I played a number of Fairy decks over the weekend, and I teched it in as a two of in each of them. I definitely wouldn’t recommend it for Sylveon GX or Gardy GX, but I used it quite a bit with Xerneas Break and a Florges stall deck (it’s not bad, MarquisEXB came up with it, hopefully he’ll post it on PDC). I will say the first couple of times I used it, I did confuse it with Teammates, and I expected to see my deck. I kept wondering why there were so few cards in my deck! But I figured it out after the third or fourth time. I only gave it a low rating because it’s only for use in Fairy decks (until we get some awesome Basic Fairy Pokemon that lets us draw five cards or something at the end of our first turn and becomes the ultimate turn 1 starter), and it might not even see use in GX decks (although with Sylveon there are always so many yummy things to grab out of the discard). 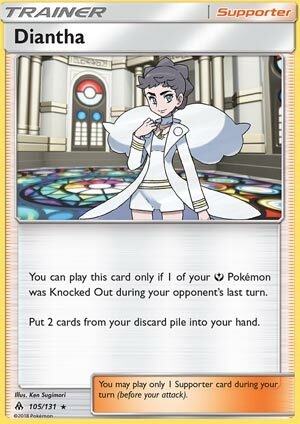 But the GX’s don’t get KO’d as frequently, so your window for using Diantha is much smaller than with single prize Pokemon. If you’re looking for some good decklists, MarquisEXB and I have been posting some on PDC. I finally posted the Ultra Necrozma GX Malamar list that I’ve hinted at a couple of times over the past couple of weeks. MarquisEXB has posted an interesting Barbaracle stall deck, and his version of Exeggutor is probably better than mine.